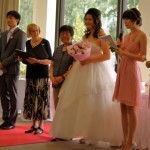 Find a professional and reliable special wedding celebrant in Melbourne. Do you want a special ceremony created just for you, but you don’t know where to start? I would love to get together with you and hear your ideas for your special day. With my experience as a special civil marriage celebrant, I can help with suggestions, and together we can plan your perfect Wedding Ceremony. Contact us on 0438 285 588 now!!! Ro Bailey had previously worked as a relationship counselor and parent educator, which provides me with great skill as a celebrant. I enjoy working with people – it gives me pleasure and satisfaction. I especially adore Celebrancy and would consider it an honor and a privilege to be involved on your special day. Have it well planned. I can set the scene for the success of your most important ceremony of your life . Read more about speaking to a Special civil wedding celebrant in Melbourne.